Alterations: none to the temple; converted into a church in the 5th century A.D. 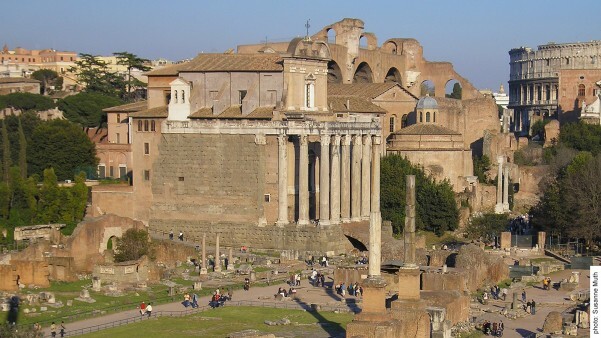 The temple was a cult site that was consecrated to the deceased Emperor and Empress Antoninus Pius and Faustina Maior. It is counted among the latest buildings erected on the Forum Romanum. The building delimits the Forum on the northeast corner and was the last prestige-enhancing temple to be newly constructed on the Forum during the Imperial Period. The ancient temple was saved from destruction, because the later church San Lorenzo in Miranda was built into it: This why this building constitutes one of the best-preserved ancient temples of Rome. The reason for the construction of the temple was the death of Emperor Antoninus Pius’ wife, Faustina Maior, in 141 A.D. After her death, the deceased Empress was given all Roman honours and deified by the Senate. 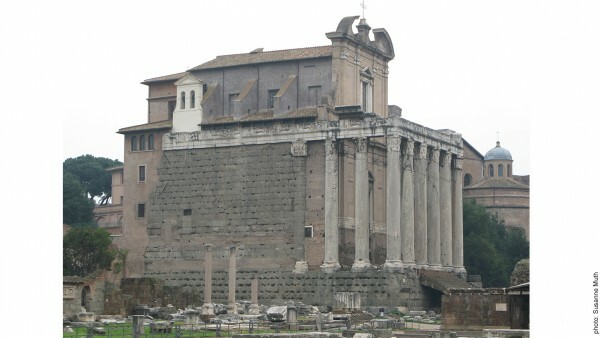 Shortly afterwards her own cult was founded and Antoninus Pius ordered that a temple be erected in the northeast corner of the Forum Romanum for the newly created Imperial cult. When Anotninus died (about 20 years later) on March 7th, 161 A.D., he was also deified by the Senate and incorporated into the cult of his wife. This “expansion” of the cult also brought about the alteration of the inscription on the architrave so that it then read DIVO ANTONINO ET DIVAE FAUSTINAE EX S C.
The building is only seldom mentioned within ancient literature. Some sources speak of the statues of the Roman elite that were erected within the temple area. 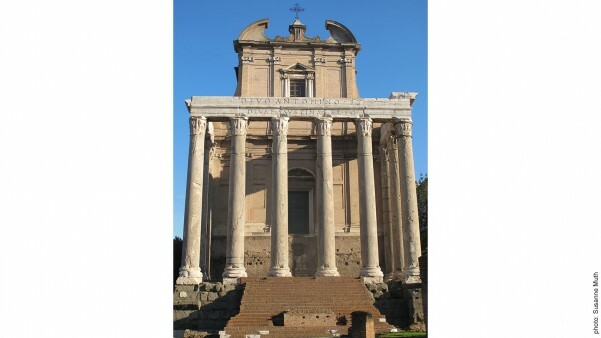 The church San Lorenzo in Miranda was built into the pronaos of the temple in the 5th century A.D. This not only led to radical alterations of the ancient architecture, but “filled” the building with new content. The temple had started off as a building of the Imperial cult, but after the church San Miranda was built in, the building served the purposes of Christianity, which had taken on a greater significance between 300 – 600 A.D. and been declared the “state religion” in 380 A.D. by Theodosius. The rise of Christianity went hand in hand with a departure from Roman polytheism and the Imperial cults. Big parts of the temple survived, because the church was built into it. This secured the importance of the structure in the Middle Ages. We cannot speculate about possible predecessor structures of the Temple of Antoninus and Faustina, because no excavations have been carried out under the temple. It is obvious that something must have stood in that location (i.e. northeast of the Forum Romanum) before the temple was erected under Antoninus Pius. The excavations that were carried out next to the temple confirm this point: Forty archaic tombs as well as traces of settlements which date back to the 8th century B.C. have been uncovered here. The permanent settlement on this area has been verified for the subsequent centuries of the Monarchy and Republic, whereby the material remains allow us to retrace the structural development from the simple clay huts to the more elaborate houses made of stone during the 7th and 6th century B.C. 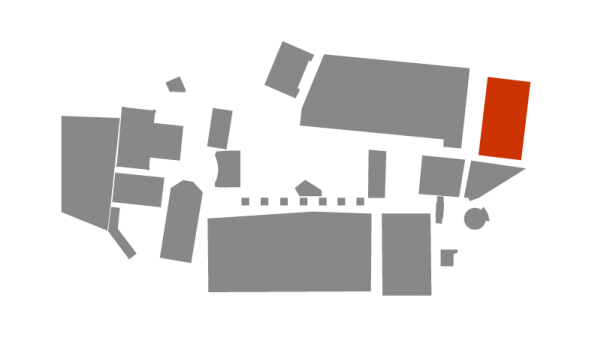 We have evidence of further residential buildings as well as buildings that served commercial purposes – both of which were located along a nearby road and constructed at some time starting from the Republican period. For the Imperial Period different kinds of marble pavements can be identified, which are not directly linked with the temple. On the basis of the uniform construction style and the employment of similar types of rock one can argue that the individual pavements were connected to an open square. Further architectural evidence suggests that this square was expanded during the late Imperial Period. 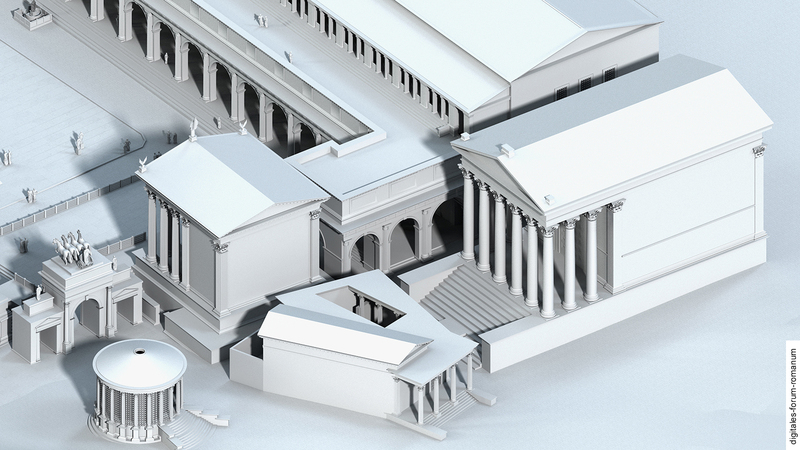 In the last couple of years it has been discussed whether the Imperial Temple of Antoninus and Faustina was integrated into an older predecessor structure from the Republic or not. 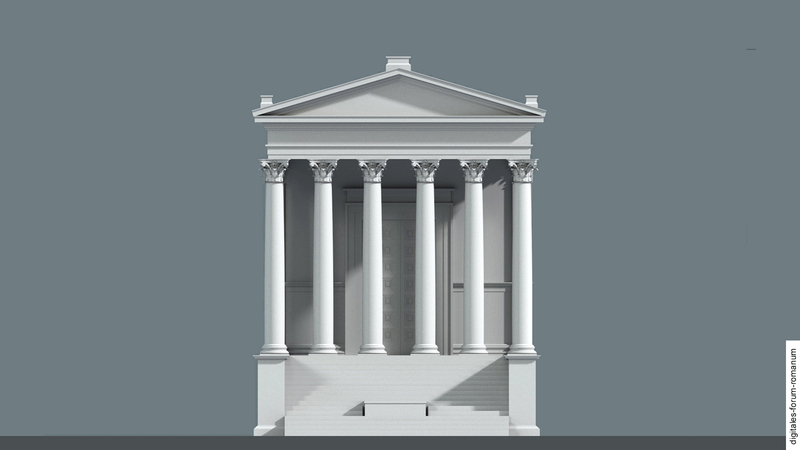 Some scholars argue that the construction style of the podium provides us with possible evidence for a preceding temple structure originating from the 2nd century B.C. The construction technique of employing blocks made of Peperino tuff in conjunction with travertine blocks is characteristic of several buildings stemming from the late Republic – however, the period of the 1st – 2nd century A.D. saw a renewed rise in the usage of Peperino tuff, which is why questions concerning the dating of the podium and the possibility of predecessor structures have been controversially debated. 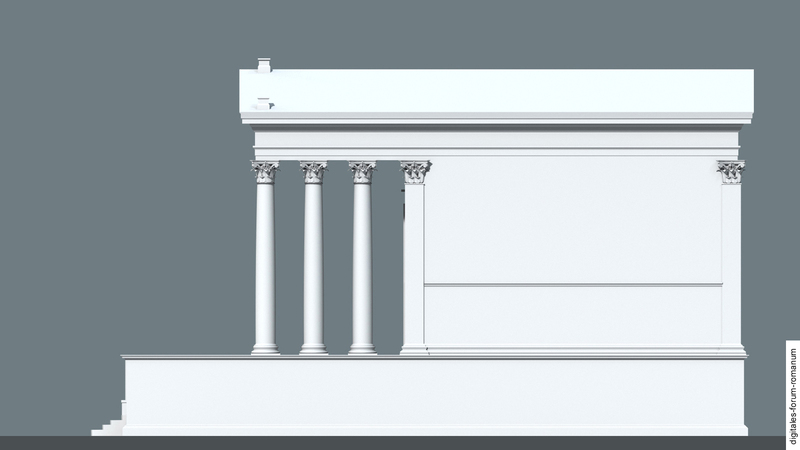 Only an exact architectural documentation of the podium as well as individual excavations can enable us to make a more informed decision in the future. 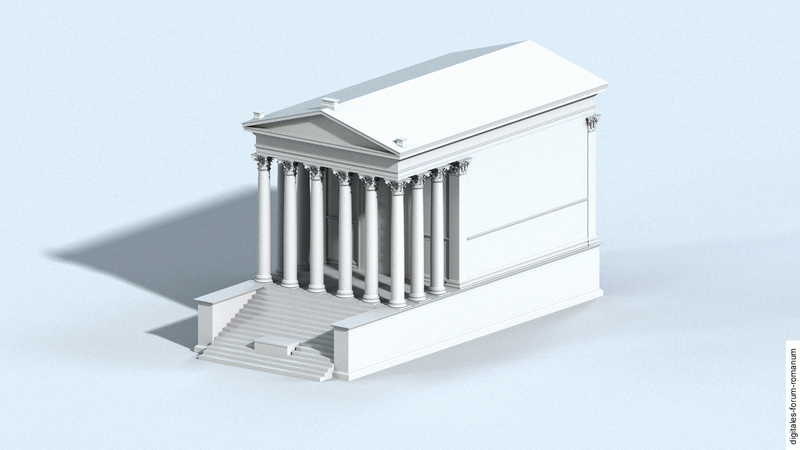 Regardless of the question whether or not the Republican temple was integrated into an Imperial building, the thought remains that the northeast corner of the Forum was once a prominent place occupied by some ambitious structure – especially if one recalls the dynamic construction policy on the Forum during the 2nd century B.C. (see Late Republic II). At first glance, the northeast corner of the Forum seems to have been a bad choice for a prestigious cult building for the Imperial couple, because the temple had to stand out against several buildings in the vicinity: Against the towering Temple of Caesar, which stood directly in front of it and was orientated towards the Forum so that it could hardly be seen from the Forum; against the Regia, which was situated directly before its frontal set of steps; and against the Basilica Paulli with its impressive architecture. 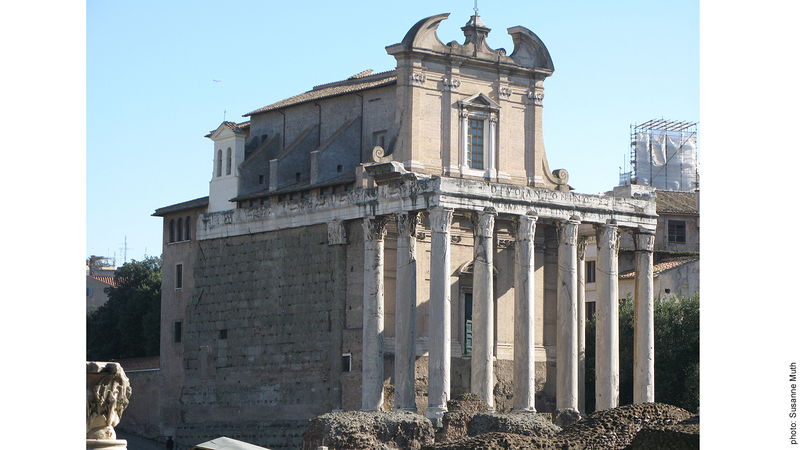 Possibly the proximity to other important Roman cult buildings, which not only shaped the Forum Romanum (e.g. the Temple of Caesar), but originated (in part) from a venerable tradition (e.g. the Regia), was the decisive factor for the choice of location. The building rests on a high podium composed of tuff ashlar. The prostyle temple, with its six Corinthian columns on the front side, faces southwards. The smooth columns made of coloured marble stand out against the white marble facing. The architrave, together with the inscription dedicated to divus Antoninus Pius and Faustina that was engraved on it, have survived through the columns; at the long sides there is a relief depicting two opposed griffins. A set of steep steps lead up to the temple at the front; because the space between the temple and the opposing Regia was very narrow here and (probably) taken up by the Via Sacra, the altar was integrated into the set of steps. Due to the good condition in which the ancient temple has been preserved the reconstruction can be based to a large extent on the existing remains. Structural elements that have not survived, such as the roof that was altered in the Middle Ages, were reconstructed in comparison with other contemporary temples. G. Boni, Foro Romano, Atti del Congresso Internazionale di Scienze Storiche (Rom, 1-9. April 1903). Bd. 5, Atti della Sezione IV: Archeologia, 493-584 (Rome 1904). K. S. Freyberger, Sakrale Kommunikationsräume auf dem Forum Romanum, in: F. Mundt (ed. ), Kommunikationsräume im kaiserzeitlichen Rom, 49-76. Topoi 6. Kolloquium Rom 24.-28. Februar 2010 (Berlin 2012). P. Pensabene, Programmi decorativi e architettura del tempio di Antonino e Faustina al Foro Romano, in: , Scritti di Antichità in Memoria di Sandro Stucchi. Bd. 2, La Tripolitania – L’Italia e l’Occidente, Studi Miscellanei 29 (Rome 1996) 239–269.